I have a different take on Ken. I think he's doing a ridiculously awesome job. He went from first driving a rally car to the WRC in 5 years. Anyone think they could pull that off and even look like they are going fast? You might say he did this with his awesome marketing skills versus driving but I say who cares how he got here, he is racing in the WRC. And he's a regular guy, not someone trained from birth by a motorsport family to be a pilot. So think about how little seat time he's had in a rally car versus the other guys. Then I look at how fast he passed on stage in Mexico and while the clock records the difference, there is no noticeable difference in Ken's commitment or speed versus Loeb or anyone else. The man is moving, but more importantly he's learning. 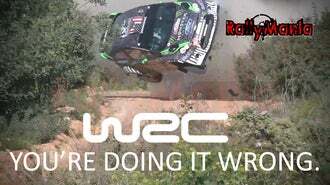 And I love it because he gives me hope that maybe one day I could drive a WRC car, even for just one round. I used to think you had to be born into rally, but maybe not. I see it like skiing, stay in your comfort zone and you don't grow, reach out of it and you have mistakes and crashes as difficulty spikes out past experience. Rally isnt like road racing where you get to practice the same corner over and over going just a little faster each time knowing that there is a sand trap to catch you, its so much harder to get better at I think. I say give him time and focus on the development, how hard he is working, and honestly how much it looks like he is having the time of his life out there traveling around the world racing rally cars. He'll start winning, just needs a little more seat time, and maybe a few more cars to dispose of. As a side note, Was I huge Ken Block fan when I got into rally? Not a chance. I barely knew who he was and was super annoyed that everyone (like everyone) was wearing this Block guy's stuff and driving Subarus. But Ken is living the dream, working really hard at it, and I think giving back to the sport immensely. He has way earned my respect and I now own one of those shirts.